Here are a few tidbits of breaking electronic communications news from 1940. "Mayday" had evidently recently been adopted as the preferred distress call rather than "SOS" or even "Help!" 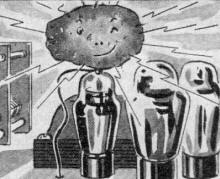 For some unknown reason a radio owner desperate to get his set working again dragged a potato across the top of a vacuum tube and it suddenly started receiving the local station. An employee of Edison Company of NYC devised a "storm detector" for warning of potential lightning strikes in the area (possibly akin to the classic silk thread and pith ball bell ringer devised by Benjamin Franklin?). In other news, 'long life' vacuum tubes were announced that would last up to 4½ years, and some police departments were finally receiving portable radios. It was an exciting time! 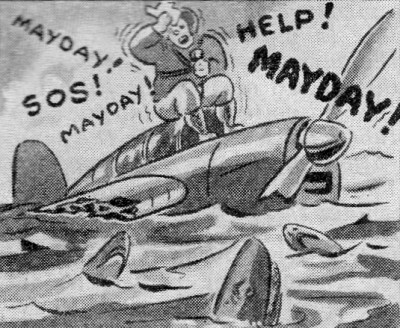 "Mayday" Means "Help!" 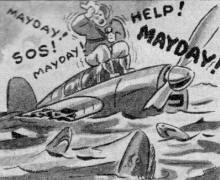 In radiotelephony, the authorized international distress signal consists of the spoken expression "mayday." This corresponds to the French pronunciation of the expression "m'aider." An aviator in distress at sea (or the skipper of a small yacht equipped only with radio-telephone equipment) must therefore say "mayday" rather than "SOS" or "Help!" if he expects to be saved. Potato Acts as Antenna! An N. R. I. student John H. Roberts tells about a customer who made his dead radio receiver work temporarily by pushing a potato over the grid cap of one tube, after finding that reception could be restored by holding a finger on the cap. John found an open filament in the r.f. tube, and deduced that the potato on the mixer-first detector grid cap was acting as an antenna. Radio Detects Storms! A radio-operated device being used by the Edison Company of New York City lights up a neon lamp and rings chimes when it detects a storm within a radius of one hundred miles. The lamp gets brighter and the chimes get louder as the storm approaches. 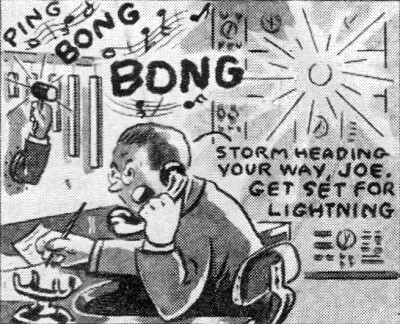 The outpost stations of the power company are notified of the approach of the storm by telephone, and prepare for lightning. Radio Tubes Live 4 1/2 Years! 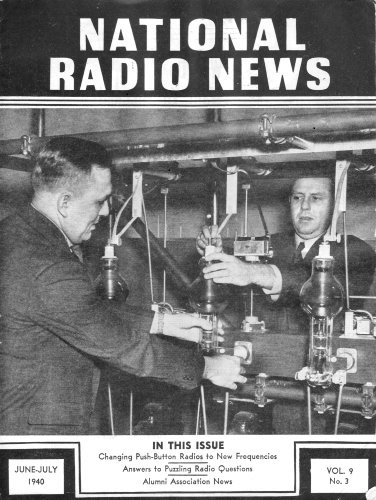 The average life of a radio tube in a typical radio receiver is now about 4 1/2 years, according to the RCA License Laboratory. An ordinary lamp costing fifteen cents lasts 1,000 hours, while a radio tube costs about ninety cents and lasts 6,000 hours. Thus, we pay just about the same per hour of use for radio tubes as for lamps. Auto Radio Gets European Stations! The first short-wave automobile radio capable of receiving European broadcasts directly has been announced by Philco Radio and Television Corporation. The chassis of this set has been locked and sealed internally to prevent its use on police bands in violation of some state laws. Domestic short-wave stations can be tuned in when reception is poor on the broadcast band because of summer static. Stencils Are Cut by Facsimile! Experiments at Lehigh University showed that stencils could be cut directly on an RCA facsimile receiver simply by feeding in ordinary mimeograph stencils in place of the customary white paper and carbon sheet. Hundreds of copies of weather maps. line drawings or any kind of printed matter sent by facsimile can thus be made within a few minutes of reception. Gas Flame Operates Radio Sets! Now on the market in England is the perfected Milnes thermoelectric generator, which operates from an ordinary gas supply and provides A, B and C power for a radio receiver. The unit sells for approximately $20, and operates a radio receiver at a cost of about 2/3 cent per hour on the basis of prevailing gas rates in New York City. Washington Gets First Booster Station! FCC authorization has been granted for a new Washington, D. C. radio station broadcasting on 1,310 kc. from two widely separated transmitters having powers of 250 watts and 50 watts respectively. This is the first time a local synchronous booster amplifier of this nature has ever been authorized. It solves the problem of securing full coverage of an area with low power. Complete radio transmitting and receiving equipment having a range of several hundred feet is now available to special New York policemen. The unit is mounted on a wide belt supported by shoulder straps, so that it can be worn under the coat, with the microphone hidden behind the vest. Evidence picked up by the officer is broadcast to other policemen at a receiver in the vicinity, where it is recorded.